Police detectives search for a serial killer among the beautiful, haunting shores of Scotland’s most iconic loch in the Acorn TV Original Series LOCH NESS. ©Acorn. Fans of the world’s most demonic doll are in for another blood-spattered treat as Chucky continues his reign of terror behind the locked doors of an insane asylum in “Cult of Chucky,” coming to Blu-ray, DVD, Digital and On Demand on Tuesday Oct. 3, from Universal Pictures Home Entertainment. The most terrifying unrated chapter yet of the “Child’s Play” saga reunites franchise creators Don Mancini and David Kirschner with the iconic cast in a twisted tale of terror. Written and directed by Mancini, “Cult of Chucky” brings back original Child’s Play cast member Alex Vincent (“Child’s Play”) as Andy Barclay along with Oscar-nominee Jennifer Tilly (“Curse of Chucky”) as Chucky’s bloodthirsty bride, Tiffany and Fiona Dourif (“True Blood”) as Nica with Brad Dourif (“The Lord of the Rings: The Two Towers”) returning as the voice of Chucky, the homicidal plaything inhabited by the spirit of notorious serial killer Charles Lee Ray. “Deconstructing the Beatles,” a four-part documentary film series is available on DVD Tuesday Oct. 3. The series explores the creation of four of the Beatles most notable albums: The White Album, Sgt. Pepper’s Lonely Hearts Club Band, Revolver and Rubber Soul. The Beatles (a.k.a. “The White Album”) was not only the band’s best-selling album, it was the best-selling album of the entire 1960’s. Fans can experience this remarkable record as never before. In “Deconstructing The Beatles’ White Album,” a multimedia lecture, “Beatleologist” Scott Freiman gets under the hood of this groundbreaking album and shows us what made it run so well. In August, 1966, the Beatles played their final concert (at San Francisco’s Candlestick Park). They had decided to stop touring—and no one knew how to be a band without playing gigs. After that last show, George Harrison said, “Well, I guess I’m not a Beatle anymore.” Of course, fans now know they more than met the challenge, producing one of rock’s greatest albums, Sgt. Pepper’s Lonely Hearts Club Band, which was released in 1967. The Beatles’ Revolver, saw the band expanding its musical horizons by using the studio as another instrument. Along with Rubber Soul, this marks an exceptionally fruitful period, as the band transitioned from the playful Mop Tops to psychedelic musical adventurers. It was released in 1966. In October 1965, The Beatles were faced with an impossible task — produce a new album of original music for a Christmas release. Within one month, The Beatles had emerged with what many consider to be one of their greatest albums— Rubber Soul. They even had time to create a double A-side single, “We Can Work It Out” backed by “Day Tripper.” Both sides of the single, as well as the album, hit number one on the charts. Peter Brosnan first heard rumors of the burial of DeMille’s “City of the Pharaoh,” a huge set encompassing 20 sphinxes and four 35-ton statues of Ramses in 1982. Too daunting to be constructed inside a 1920’s-era studio soundstage, DeMille and his production staff found their “faux-Egypt” on the beaches of California’s Santa Barbara County. When they finished shooting, rather than leave the sets to be repurposed by second-rate hacks hoping to steal a little of his thunder, DeMille had the sets buried in the sand, counting on time and coastal elements to eventually destroy them. Fascinated by this bit of movie lore about “the last of the great sets” and optimistic that much of the set may have survived, Brosnan and film-school friends Bruce Cardozo and Richard Eberhardt set out to arrange for an excavation and make a documentary. What followed was decades of on-again, off-again excavation efforts, as the project faced seemingly insurmountable funding stumbles and bureaucratic obstacles. 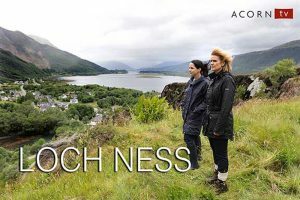 The atmospheric crime drama and Acorn TV Original Series “Loch Ness” makes its DVD and Blu-ray debut on Tuesday Oct. 3 from Acorn TV, an RLJ Entertainment brand. The beautiful, haunting shores of Scotland’s most iconic loch are the stunning backdrop for this crime drama written by Stephen Brady (“Vera”). Set against Scotland’s hauntingly beautiful landscapes, this tense thriller follows Annie Redford (Laura Fraser, “Breaking Bad”), a small-town detective thrown into her first murder case. When a man is found dead at the bottom of a cliff, DCI Lauren Quigley (Siobhan Finneran, “Downton Abbey”) arrives to lead the inquiry, along with forensic psychologist Blake Albrighton (Don Gilet, “EastEnders”). The local police clash with these outsiders, but when more bodies turn up, the team theorizes that a serial killer is stalking the shores of Loch Ness. As the case swells to engulf the whole town, Annie becomes immersed in the investigation, unintentionally pushing away her husband (Gray O’Brien, “Coronation Street”) and teenage daughter (Shona McHugh). With grief, terror, and suspicion shattering her community, Annie strives to expose the monster hiding in plain sight. The DVD and Blu-ray two-disc sets feature six episodes, plus bonus cast interviews, behind-the-scenes featurettes, and a photo gallery ($49.99 suggested retail price, Amazon.com). “Loch Ness” made its U.S. premiere in June on Acorn TV. Before Debra Messing was Grace Adler on NBC’s “Will & Grace,” she was Stacey Colbert on the short-lived Fox sitcom, “Ned and Stacey.” Now, fans can once again watch the hilarious series anytime they want, as “Ned and Stacey: The Complete Series” is finally available to bring home on DVD from Shout! Factory. Front Row Features is giving away four copies of the release, which includes all 46 episodes from both seasons–including 11 unaired episodes from Season 2 fans can enjoy on DVD for the very first time! To enter, simply email socalmovieeditor@aol.com by Monday Oct. 9 for your chance to win. Good luck! Front Row Features wants to send Mickey Mouse and Donald Duck to one lucky reader’s home to celebrate Halloween and Christmas with their family. That’s why we’re giving away a copy of “Mickey Mouse: Merry & Scary” to one lucky reader! The new Disney DVD release not only includes two 22-minute holiday-themed episodes—“The Scariest Story Ever: A Mickey Mouse Halloween Spooktacular” and “Duck the Halls: A Mickey Mouse Christmas Special”—but also five 3-minute bonus shorts: “Ghoul Friend,” “The Boiler Room,” “Black & White,” “Entombed” and “Split Decision.” To enter the contest, simply email socalmovieeditor@aol.com by Monday Oct. 9 for your chance to win. Good luck!